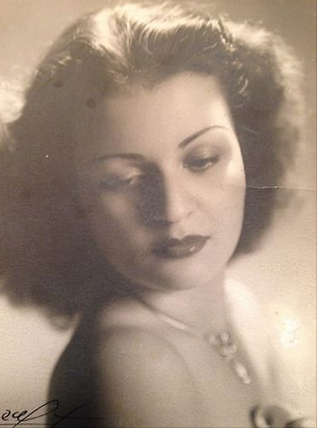 My mother as a young woman, Ana Srebrenic Rotmil. It’s been five Mother’s Days since the last one I celebrated with my mom. Each Mother’s Day passes, and I feel the loss even more. Not a day goes by when I don’t think of her in some way. After a mom dies, everyday is a kind of a Mother’s Day of remembrance. Mom never seemed to care much about mothers day until the day it arrived. “Oh, tell him I need some dish towels!” she would shout from the kitchen as the faucet was running. We’d always get her the usual. 1) Whatever household product she realized she needed two minutes after she said she didn’t need anything. 3) Russell Stovers Ambassador Chocolate Assortments, followed by a brunch at Restaurant X – Also known as the Bully Boy in Congers, NY. As a young Jewish first generation Cuban female in a household of east European and Russia Jews who were of the old world of religion and social mores, it was likely marriage and children were a must. Add that to the times the whole world was living in, and it was a done deal – you got married, you had kids. If you didn’t -you were a spinster without a home. I wonder if my mom really wanted to be a mother. With all the Jewish yentas and the 1950’s breathing down her neck, my mother’s desires seemed to lean more toward a career. She was an enterprising woman with her own store in a hotel yet found suddenly married, a mother to a baby son and divorced – by the age of 20. The reasons behind such a quick decision so young in her life was never made clear to me. She wouldn’t talk about her marriage, but to the anger of my now 64 year old older half brother. She threw herself into her work and the freedom is seemed to give her, at the expense of her growing boy – who was raised by a grandmother. Years between mother and son would grow cold. Sfter Castro kicked out the capitalists in Cuba, my mother went to New York and opened a dress boutique. She met and married my father – then had me. When a Sears moved in across the street, the writing was on the wall: Her business was doomed, and indeed, she lost customers. So, she closed up shop and ended her business life. Then, she made up for all her lost time with her son on me. She was very loving. But, after a succession of changes and life’s left hand turns, she was also handling mental illness. Instead of the mom on the go with the career and the friends, I got the mom who was scared and isolated. Although I got the attentive loving mother my brother didn’t get – I also got the mom with the nervous breakdown and in constant state of crisis. But, I also had a mother who had long periods of lucidity. I got the mom who encouraged me to be successful, to never depend on a man (despite she now had to), and to be free to be a business owner who lives like on her own terms. She never poured on the old jewish guilt she got from the old world family expectations. Never once did she push me to find a man and get married. Never once felt disappointment because I could never find a guy and settle down. Never really cared that I didn’t give her grandchildren. And thought it’s wonderful to want these things for a daughter – she just wanted me to be what she couldn’t find herself to be: Free. I understand this now. Every since my mother passed in November 2010, I seem to understand her – as if her emotions, now floating in the ether – are speaking in my subconscious. Mom – I will change the pattern. I will be successful and be live life asleep at the wheel as I go to a job I no longer love, and rage with anger over being stuck in a 9 to 6 world. I will be what you had hoped you could have been because I know I want it too. I will be what you once were before life took you in a direction, before your traded your freedom for security. Even though you’ve alienated certain people, I see it was due to them making you feel less than your true worth. You didn’t have to say anything. I saw it myself. I love you mom. Happy mother’s day. Categories: ON WRITING | Tags: Mothers Day | Permalink.